…with a personal message for anyone who books speakers for their organization or event-whether in a meeting, workshop, or conference setting. Because I’m also a cancer survivor myself (Hodgkins Lymphoma, stage IIB extensive), you can rest assured that I speak from a place of deep compassion for – and personal understanding of – the issues patients and their families have to deal with every day. 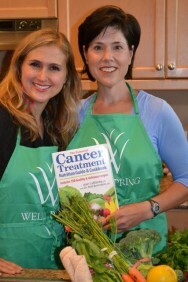 In my work as a Registered Dietitian with my own practice and Program Leader at the Wellspring Cancer Support Agency in Toronto, Ontario, I have the privilege of working with cancer patients, survivors, and caregivers on a regular basis – providing nutritional education in the form of one-on-one counselling, workshops, lectures and cooking demonstrations. As the author of “The Essential Cancer Treatment Nutrition Guide and Cookbook”, co-developer of “The Cancer Risk Reduction Guide” and professional speaker, I’m fortunate to be able to be able to take my message to the public with the kind of nutritional guidance anyone concerned with cancer needs to know. My Cancer Treatment is Finished… Now What? A first person account of the fear and anxiety that plagued me after treatment finished. I introduce The 3 Keys to Cancer Risk Reduction that allowed me to get out of fear and helplessness and take back control and take concrete steps to help reduce my risk. This talk is very popular with an audience of cancer survivors and health professionals. Do you think if you were shown two different websites on the same nutrition topic that you could choose which one was credible and which one wasn’t? It’s harder than you might think and audiences are shocked at what they discover in this talk. I’ll give you to tools to become a discerning consumer and to protect yourself from hucksters and frauds. This is a great talk for general audiences including lunch & learns and health & wellness sessions. Most of us know what to do to improve our eating and loose weight. Why aren’t we doing it? Are those pesky cravings throwing you off and derailing your best efforts? What would it mean for you if you could drastically reducing your cravings? Give your will-power a rest and set yourself up to success with this new approach to healthy eating. This talk is good for all audiences including general audiences, and cancer survivors, especially those looking to loose weight. This is by far my most popular talk requested by health professionals. That’s because every nurse, dietitian, doctor, pharmacist and other allied health professionals get asked these questions every day. Does sugar feed cancer? Should I be using coconut oil? Does the alkaline diet cure cancer? You can customize this talk by asking me to review your selection of popular cancer diets including ketogenic, raw vegan, juicing, Gerson therapy, Budwig protocol, paleo or gluten free. Health care professionals will feel much more confident in handling these questions and have a better understanding of the research that support and refute these diets. Are you planning a function for patients and family at your cancer centre? Planning a professional conference? I am comfortable presenting to grand rounds at large teaching hospitals or small family and caregiver groups. If you have a teaching kitchen then I can even present a cooking demonstration! I have worked with several cancer support agencies to help with fundraising through sales of my book – The Essential Cancer Treatment Nutrition Guide and Cookbook. A nutrition session followed by book signing and sale is one way where I can help to raise valuable funds for your centre. Contact me for an option that will work with your group. I’m always happy to speak with reporters, bloggers or other media too, to answer your questions about nutrition and health. Mississauga: CAREpath Inc Oncology Nurses Day: My Cancer Treatment is Finished…Now What? Hamilton: Life After Breast Cancer Conference: My Cancer Treatment is Finished…Now What? P.S. For Media Requests and Appearances, or more information on how I can help with your next workshop or conference, please contact me via email at info@jeanlamantia.com. Breakfast TV in the studio with Dina Pugliese. 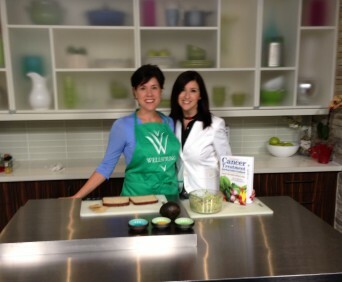 Preparing Curry Chickpea and Avocado Spread with Sonia Sache on Rogers Daytime Mississauga.